Yossi Milo Gallery is pleased to present Interwoven, an exhibition of artworks woven from photographic prints and fabric by artist Kyle Meyer. Kyle Meyer has worked between eSwatini (formerly Swaziland) and New York City since 2009, creating richly tactile artworks as conceptually layered and complicated as they are visually lush and intricate. Portraits from his Interwoven series reflect an interest in infusing digital photography with traditional Swazi crafts and in giving voice to silenced members of the LGBT community, who are marginalized in eSwatini. Tension between the necessity of the individuals to hide their queerness for basic survival and their desire to express themselves openly inform both the subject and the means of fabricating Meyer’s unique works. Each piece from the Interwoven series is labor intensive, taking days or sometimes weeks to complete. Meyer photographs his subject wearing a head wrap traditionally worn by women using a vibrantly colored textile selected by each man. 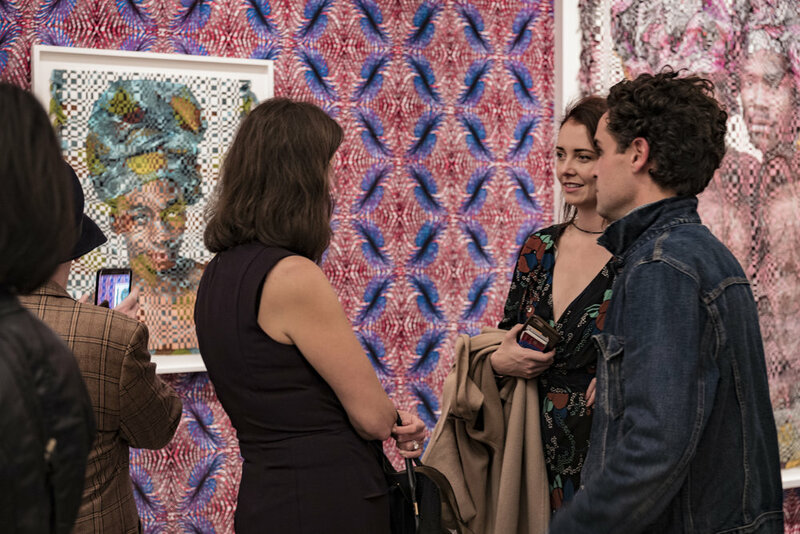 He then produces a large-scale print of the portrait and hand-shreds the photograph together with the fabric from the head wrap, weaving the strips into a complexly patterned, three-dimensional work. With the final portrait, Meyer presents each man’s individuality and beauty while using the fabric as a screen to protect his identity.